Good evening to all of my friends! Friday is almost here..whoo hoo! What's everybody doing this weekend? I have a Birthday party to attend for my neice Saturday and then a Stamp show on Sunday. I am meeting up with a few blog friends that I haven't ever met before. I can't wait!! So, I made a layout with my twins' 6th birthday pictures today. Here it is.. This was easy to put together and that's what I love..easy!! :) I hope you all have a good evening. Thanks so much for stopping by! The winner is Sharla from This thing called life! Sharla please email me at heathernovinger @ hotmail.com (no spaces) with your address! Congrats and I hope you like your goodies! Click HERE to enter my ribbon giveaway! Choosing winner later today! I can't believe Rye turns 6 months tomorrow! She loves to play with Gretchen's keyboard already! Soo cute!! I also want to share a recipe for banana bread with you all. I have posted this before months ago but I want to share again because it is so good and so easy! I have literally made this hundreds of times!! It turns out perfect every single time! In Large bowl mash bananas, add sugar and egg, mix..add rest of ingredients and mix well. Bread takes about 1 hour but you can also make into muffins or mini muffins! These muffins/bread are always a hit!! So easy, doesn't take too many ingredients, and I just use one bowl ~so easy clean up, too! I hope you all have a great day! I will be choosing a random winner for the ribbons, laces, twines, and flosses later today so if you haven't entered yet, go comment on that post! (Link at top of this post.) As always, thank you so much for stopping by and leaving me a comment so I know you were here! Click here to enter my give away! Hi Again Friends! I have a quick project to share with you all before I go to bed. 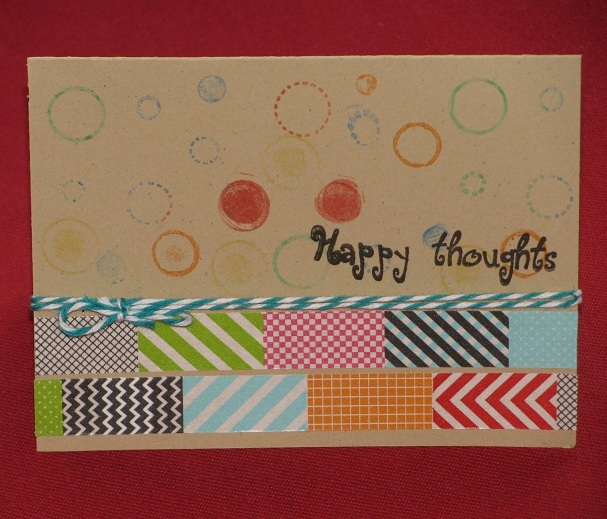 I made this card to enter in the "Give a Hoot" challenge over at Getting Cricky with K. Andrew! You must use an owl and something recycled and I was sure to do both! 3 Girl JAM in iris for the rose on the owls head and baby girl for the bow. I used core'dinations cardstock for the most of the papers, give a hoot cricut cartridge, and a painted pop can tab. Head on over to Getting Cricky to join in on the fun challenge this week! Have a great night! Check out this Awesome give away! For my give away click here! Photo of Giveaway!!! Ribbons, Laces, Twines, and Flosses! To be entered in my give away comment HERE! Thank You's, Fun Finds, and a GIVEAWAY!!!! Hi Crafty Friends! Hope you all had a good weekend! Mine was pretty good. Went to a crop on Saturday, a bowling Birthday party for my daughter's little friend yesterday and then shopping. Whoo hoo! So today, I want to say "thank you" to 3 Girl Jam for the beautiful hand dyed crinkle ribbon I recieved in the mail Saturday! I won it during the blog hop last weekend on their facebook page. Look at this ribbon..
Next, I want to say "Thanks so much" to Carri at DoubleClick- AKA Abusybee for the Domino Cuttlebug folder, embossed paper, and card! 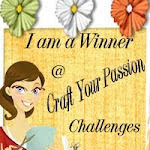 I won some blog candy at her blog recently during an embossing blog hop she was involved it. Here's a picture of what she sent..
Look at the adorable little card and the embossed paper!! 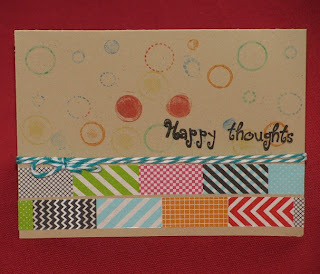 Please check out Carri's blog for beautiful cards daily!! Now, I want to show you the cool cheap stuff I found yesterday while thrift store shopping! I found this for $2!!!! Here is what I did with it.. 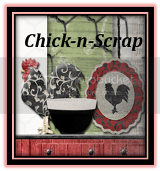 It's my new scrap organizer thingy! lol This is only some of my scraps..it's out of control! I can never find what I am looking for so I cut a new piece. I sure hope this helps! Next, I found this ribbon for just $2! Then this huge spool of cream colored embroidery floss stuff for just $1.. I also found this 11 1/4 inch doily for 35 cents.. So, for the organizer, ribbon, floss, and doily it was $5.35! AWESOME! Have a great day to everyone! I love you all! Thanks for coming by to see me! CARD using my new K.Andrew Designs stamps! Happy Friday Friends! I know I certainly am happy because my new K. Andrew Designs stamps came today! Yay! 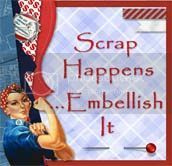 I have heard Kristal's stamps are awesome and she donates a portion of every set of stamps she sells to charity! Wow, that's awesome! As soon as I got the stamps today, I ran in my craft room and started playing. here is what I came up with.. So, there's my card..hope you like it! I will tell you, those stamps really are nice! They stamp so easily! Most of the time it takes me 3 or 4 tries to stamp perfectly and these stamped just right the first time! That's it..super easy! Thanks for stopping by my blog today! Please leave me a comment so I know you were here..I'd love to visit you, as well! Be sure to stop by Getting Cricky with K. Andrew and order some stamps! Hi Friends! Hope you all are having a great week! I got some crafty time in last night and put some real quick things together and I wanted to share them with you. It maybe took me 2 hours for everything.. Sometimes I take a long time trying to make something perfect (like the green frame) and sometimes I just want to be productive..that's how I was feeling last night! lol Thanks so much for stopping by to visit! I hope you all have a good day! I painted lots of layers with different paints, added all kinds of goodies from my stash, and used ctmh stamps, and I made all of the flowers with my Flower Shoppe Cricut Cartridge. Hope you all like my creation! 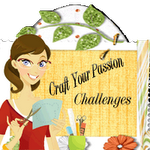 :) Head on over the Artful Times and join in! Good morning, friends! I hope you all had a nice weekend! I ended up staying home all weekend but that's okay..I spent time with my family and made a few things, too! Here is my first project to share..it's an owl made out of clay and scrappy supplies.. Isn't he cute?! I love owls so I think so! 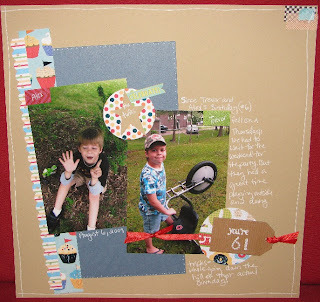 ;) I am going to link him up to the Inspire Me Fridays Link Up Party over at the Joyful Stamper. 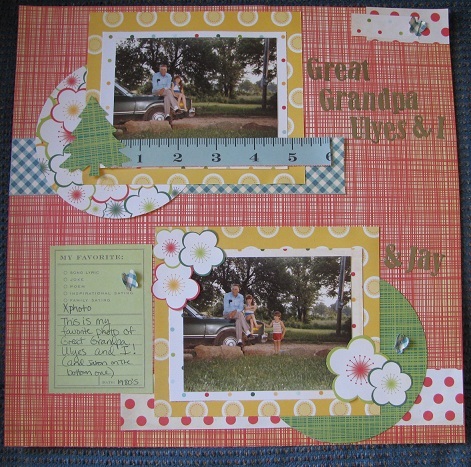 I also have a layout for you today with photos of my Great Grandpa, my brother, and I back in the early 80's. Here it is.. I used Cosmo Cricket stacks called Material Girl and Garden Variety, some letter stickers, a Fiskars butterfly punch, EK Success tree punch, Martha Stewart circle cutter, atg, and a smash pad journaling paper. That's it..super easy! I hope you like my projects for today! Looking forward to seeing what all you have been up to! Have an awesome day! Thanks for stopping by to visit! Would you like to win $100 gift certificate to Scrapbook.com? Hope you like my very girly layouts today! Enjoy the rest of your weekend. As always, thanks SO much for stopping by, commenting, and following!! Good morning to all! Hope you all got to sleep in today. :) Today is the last day of Disney week. 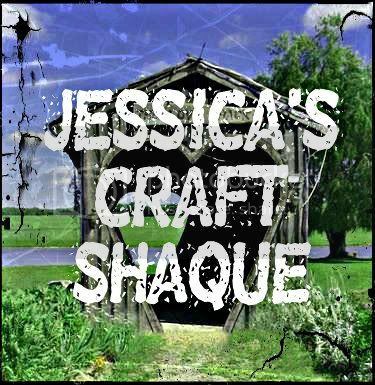 I have 3 projects to share with you. Guess what?! I found my Disney stamps! (and I was missing pictures..found them, too!) I am so happy to have found them..it was driving me crazy! I was supposed to go to a crop today but had to cancel because Ryelynn isn't feeling 100%. 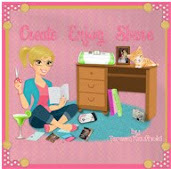 I am hoping to get in my craft room to work on some things for some challenges I want to enter. 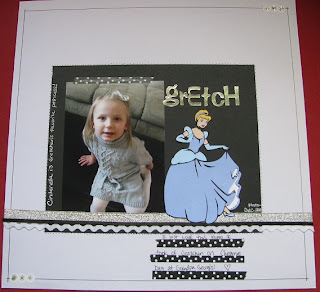 Okay, so here is card number one..
Black and white cardstock from Joann's, smash tape, mickey stickers (put on a piece of paper and cut out), recollections stamps, stampin' up white ink, white jelly roll pen, corner rounder, and atg. My next project is smash pages about Ryelynn at 5 months.. Smash book, smash tape, smash pen, white cardstock from Joann's, Cinderella and flower stamps, inkadinkadoo black ink, pictures taken a few days ago. Lastly, (is that a word? lol) I have a card I made for my significant other for Father's Day. His name is Donald and has always been a big Donald Duck fan, so I think he will like this card. Core'dinations cardstock (both sides..black and yellow), smash tape, mickey's celebrate cuttlebug folder, Disney stamp for Donald, archival colored pencils, Father's Day stamp by See D's, white cardstock from Joann's, atg. That's all I have for you today. I hope you have all enjoyed Disney week as much as I have! Please check out my friends' pages down below for more Disney inspiration!! Thank you to Janis at Pause Dream Enjoy for the idea and for letting me join in!! Have a great weekend! Thank you so much for stopping by, following, and leaving me comments!! So, I'm kind of ticked off today because I lost my Mickey Mouse stamp set. I had it last weekend at a crop and I wanted to use it the last 2 days and it's not anywhere!! I guess that means it's time to clean uo my craft room a little. Does this ever happen to you? I usually NEVER lose anything so this has really got me stumped! P.S. I bought my first stamp set by K.Andrew called Owly Hoo. I LOVE owls and this set is so cute! You should check out her 2 day sale over at her blog called Getting Cricky with K Andrew! Hi all! The last couple days have been crazy around here and I still have lots to do so this post will have to be short and sweet. 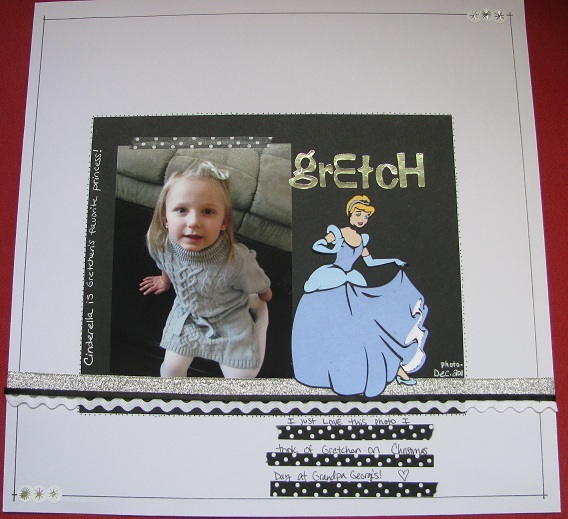 My daughter, Gretchen, LOVES Cinderella, so I made this quick layout with her favorite princess on it. I hope to have another project for you all tonight or in the morning. I am loving everyone's Disney Week creations!! Here is my simple layout.. I used papers from my stash, polka dot smash tape, silver letter stickers, a few different ribbons in black, white, and silver, a white jelly roll pen, a black smash pen, atg, Cinderella die cut from Cricut, and a few small snowflake like stickers...That's all! Thank you for coming by, friends!! Thank you for all of your comments during Disney week!! 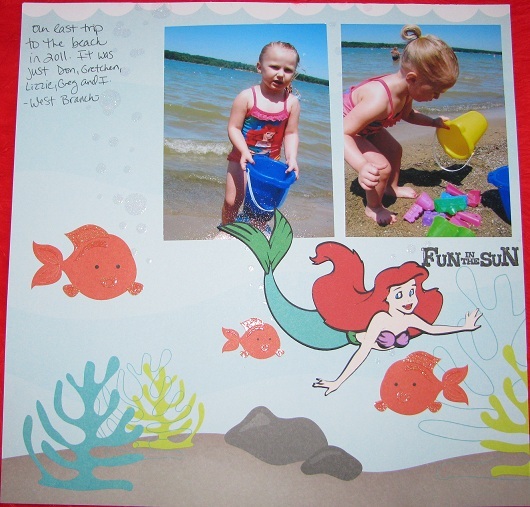 The paper is from a mambi stack, the Ariel was cut from a Cricut cart and my imagine, used a inkadinkadoo stamp and ink, atg gun, and smash pen. That's it..super easy! I liked the paper so I didn't add a whole lot to it. Minnie was cut from Mickey and Friends, the papers are all from my scrap bin, twine, letter stickers, 4 flowers and a brad are all from my stash. Hope you like my Disney projects! I'm having a lot of fun making them! Thanks, Janis!! Hope you have a great night. Thanks so much for visiting and commenting. AND Thank you to my new followers!! I used papers from my scrap pile, Disney Cricut cartridge, some stickers, Martha Stewart scoreboard for the rosette, buttons, twine, atg, hot glue,and an American Girl border punch. Please head over to Pause Dream Enjoy to enter into the challenge, too! Good morning to all of my friends and future friends, too! I hope you all had a lovely Easter! This is day number two of Disney week and I have a couple of creations to share to share with you. My first project I made is a card.. I used papers from my stash, a Daisy Duck stamp, archival colored pencils, smash tape, a polka dot photo corner, a stamp for the sentiment, a few rhinestones and my atg gun. Super simple card! For my next project, I made a layout with a photo of my twins at 3 weeks old. (they are now 8 1/2!) They were wearing Tigger outfits so I thought it would be cute to go with a Pooh theme. 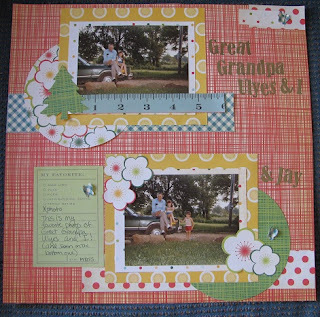 Here it is..
For this layout I used the Pooh font cart, cricut imagine, letter stickers, DCWV playtime stack papers, dimensional squares by glue arts, atg, and a smash pen. Hope you like my projects for today! I plan on posting at least one each day and hopefully more. I hope you all have a great week! Thanks for stopping by! Be sure to check out my friends' blogs to see what they came up with for today! My Blog Candy Winnings~Thank you! Please Join Us For Disney Week!! !